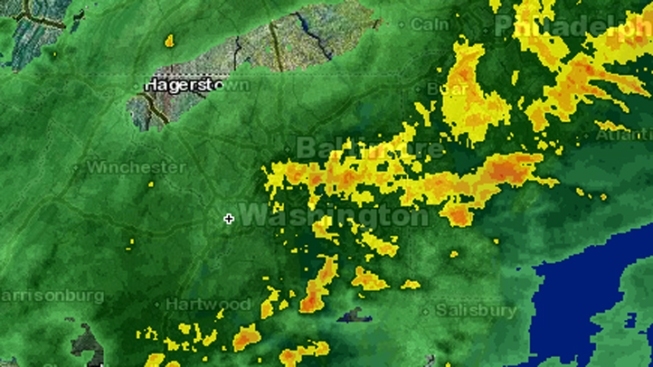 A radar image for the D.C. area as of 3:25 p.m. Tuesday. A flash flood watch has been issued throughout the entire D.C. area, lasting until 6 p.m.
A more serious flash flood warning has been issued for parts of Prince George’s, Anne Arundel, Charles, Calvert, Orange, Greene and Madison counties, lasting until 4:30 or 5 p.m. The D.C. area has already seen three inches of rain, but another inch is predicted to fall before the day is over. Storm Team4 Chief Meteorologist Doug Kammerer said some parts of the region could see floods due to the accumulation of heavy rainfall in recent weeks. Flash floods occur more quickly than normal floods and usually happen where there is water runoff, such as streams, creeks and roadways.